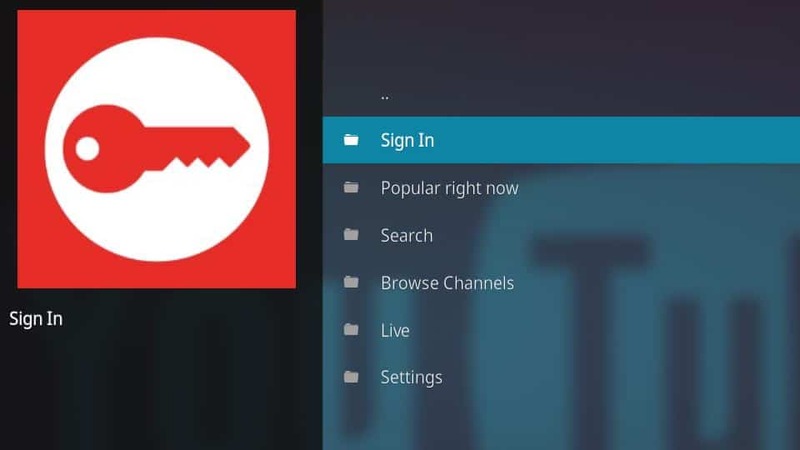 Kodi is a streaming media app that connects to your tv or runs on a mobile device. It’s compatible with every major phone, tablet, and streaming hardware around. Kodi is a great solution, whether you’ve got your computer hooked to your tv with an HDMI cable or want to unlock the real power of your Firestick. 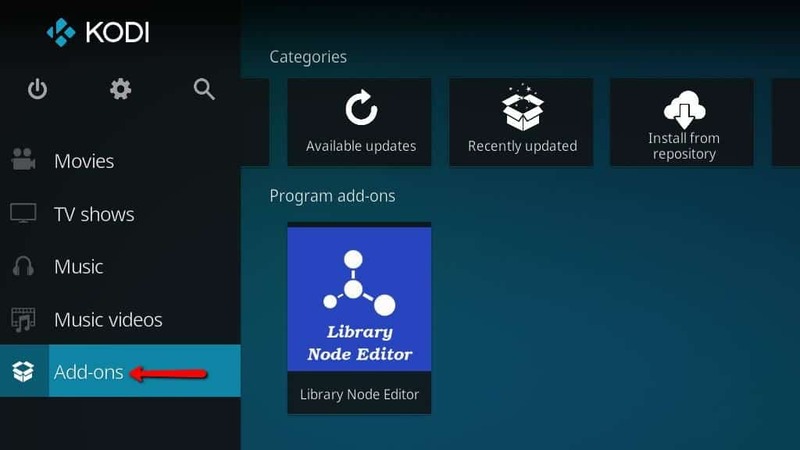 As of this writing, the latest stable release of Kodi is 17.4. The latest release is available to download here. Before you get started, I really recommend installing a VPN. YouTube is notorious for restricting your content based on where you happen to live. If you’re in the US, it means missing out on the BBC, including all of their sports coverage and extras from popular shows like Dr. Who. And personally, I have concerns about ISP’s monitoring streaming content. I think it’s pretty obvious that ISPs are just dying to pass legislation against net neutrality, so they can start paying attention to how much bandwidth you use on streaming video–then charging you extra for it. Connecting to a VPN encrypts that traffic, so your ISP has no idea what you’re doing with your internet connection, which is the way it should be. IPVanish is the only VPN we’ve tested that delivers the speed you need for streaming, with low-latency connections across the globe. It also works with the widest range of devices, including FireTV and Firesticks, which no other VPN can do right now. You don’t need to change any settings, just sign up for IPVanish, install the client on your device, and connect to a server anywhere in the world. I’ve been using IPVanish for a few months, and I think the convenience, privacy, and speed are worth paying for. The YouTube Kodi addon is available to download from the official Kodi addon repository. In order to install it, you’ll need to browse through the list video addons. Here’s how to do it. 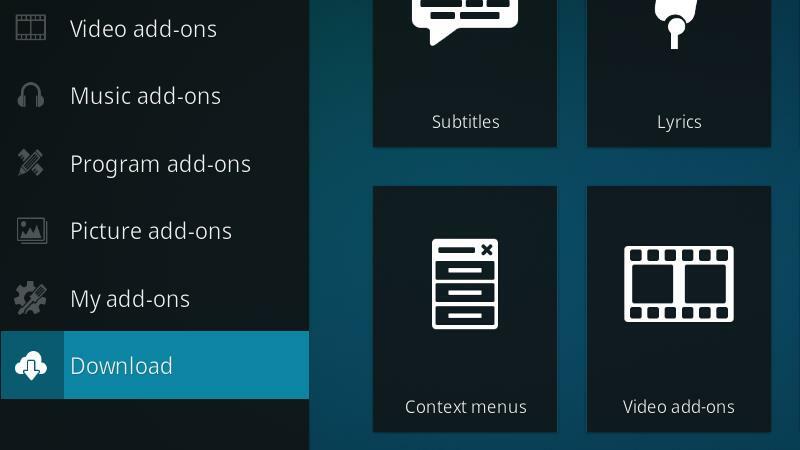 Start by clicking the Addons menu item on Kodi’s main screen. You may have more entries in your menu than I do, as I’ve hidden a lot of the ones I don’t use in order to reduce clutter. It’s typically at the bottom of the list. Then click the Download menu item. Browse to the Video addons icon and click it to open up the list of available video addons. Next, scroll down until you find the YouTube menu item and click it. Then click the Install button on the lower left to begin the installation process. 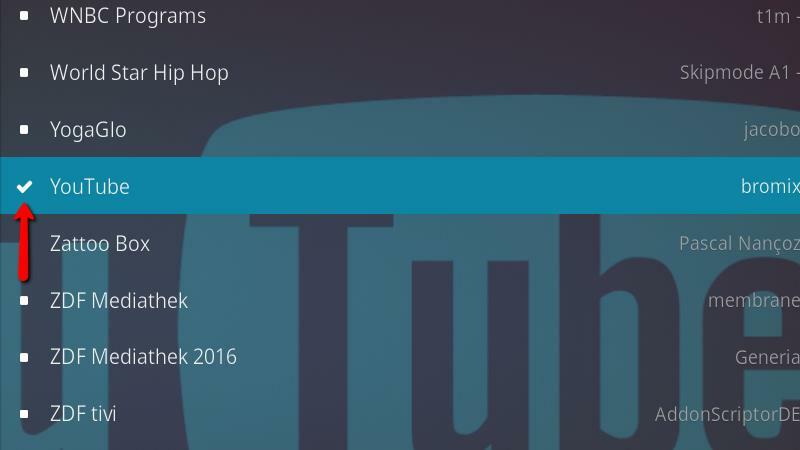 Once the YouTube Kodi addon has started to download successfully, the icon in the list will change. The icon will change to a check when the YouTube Kodi addon is finished installing. 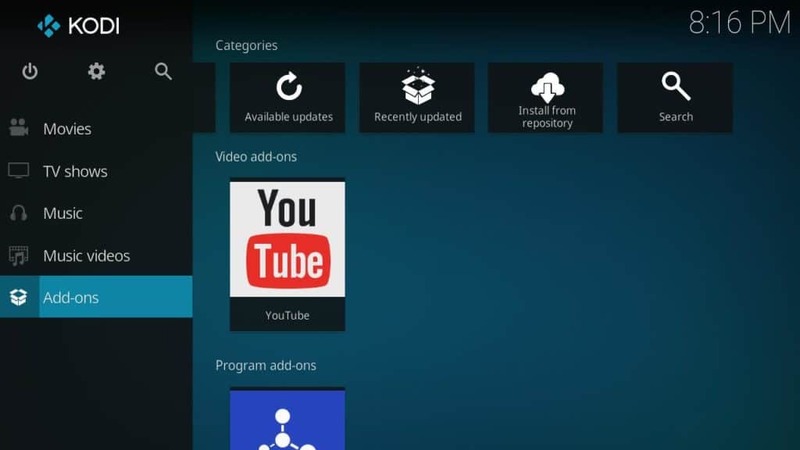 Now you can launch YouTube from the addons menu. 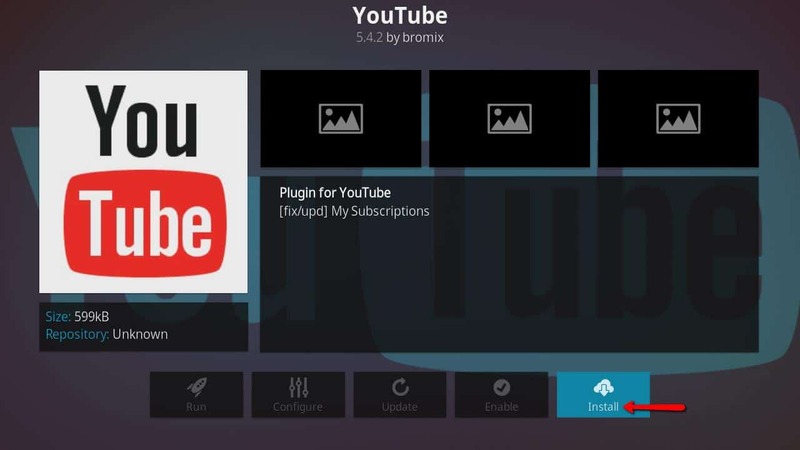 The YouTube Kodi addon works out of the box, but there are a few settings you want to look over after the installation is complete. 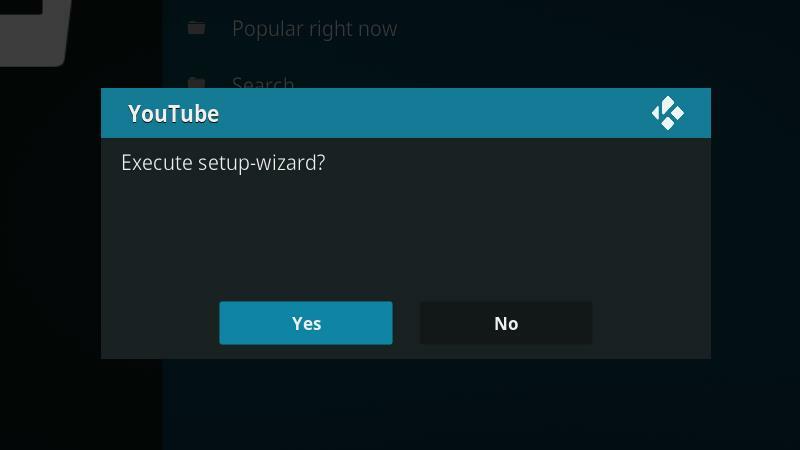 The first time you launch the YouTube Kodi addon, you’ll be asked whether or not you want to run the setup wizard. 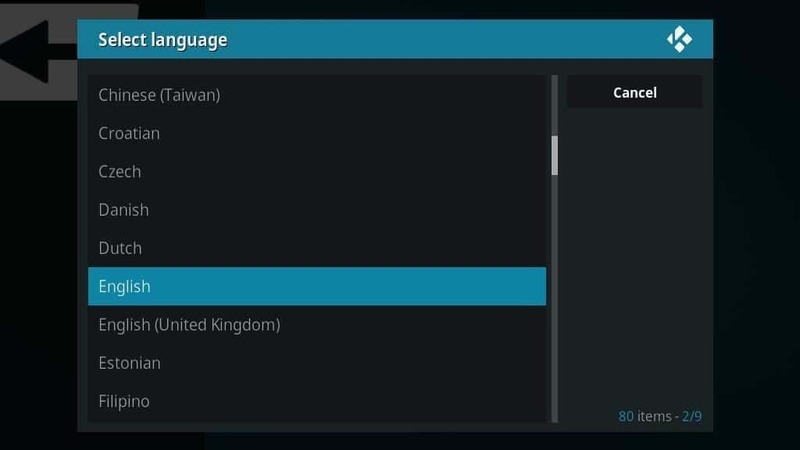 Running the wizard is optional, but I like to click the Yes button and step through it in order to set my language and country. 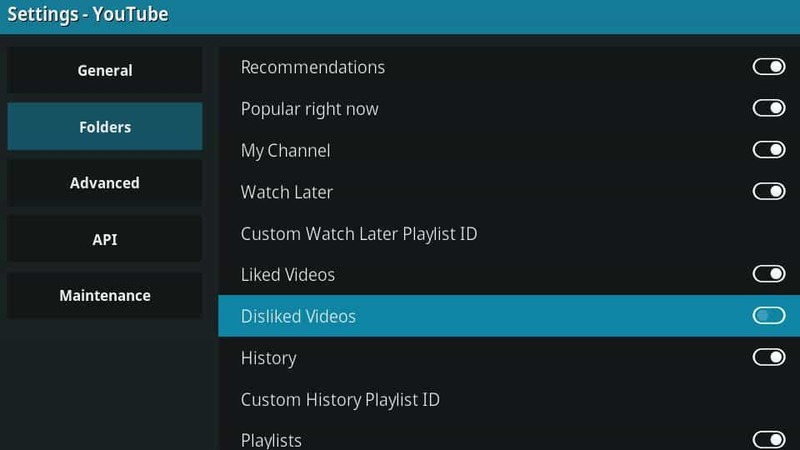 You can change these settings later in the YouTube Kodi addon options menu. Choose your language from the list and click it to go to the next step. 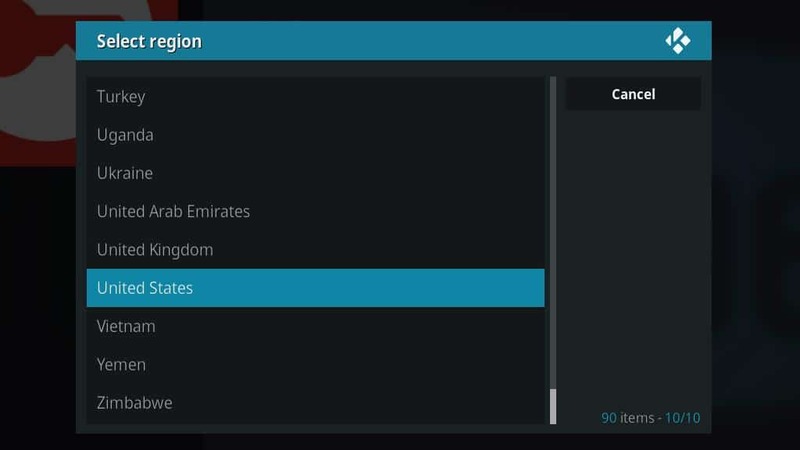 Then select your country and click it. That’s all there is to the setup wizard. Keep in mind that these settings only control which suggested videos you see, and the language of the YouTube interface. If you want to be able to access YouTube content from other countries, you’ll still need to install a VPN to control which content you’re allowed to view. 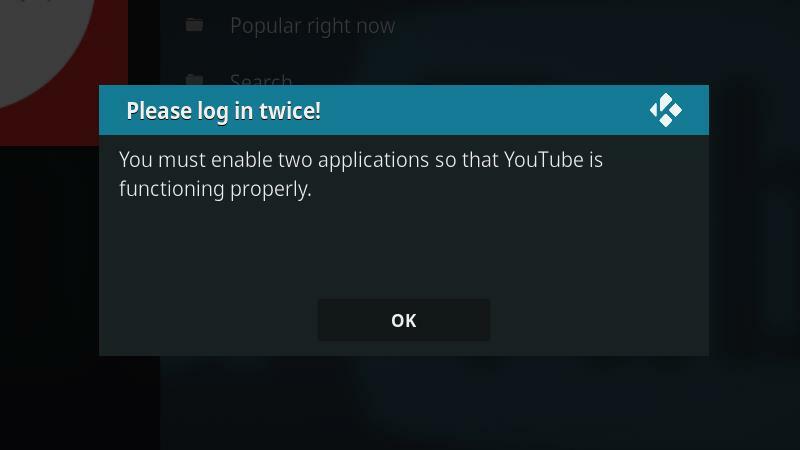 Most people will want to link their existing account with the YouTube Kodi addon. Once your account is linked, you can browse through your subscribed channels, have access to your favorites, and watch playlists you’ve already made. Start by selecting the Sign in menu item from the top of the main menu. You’ll be warned that you have to repeat this process twice. That’s normal, and it’s easy enough to do. Click the Ok button to move to the next step. Next, a screen will appear giving you your confirmation code and displaying a progress bar. You need to login to YouTube and confirm each code before the progress bar fills. It takes a little more than 5 minutes to fill completely, so you have plenty of time. 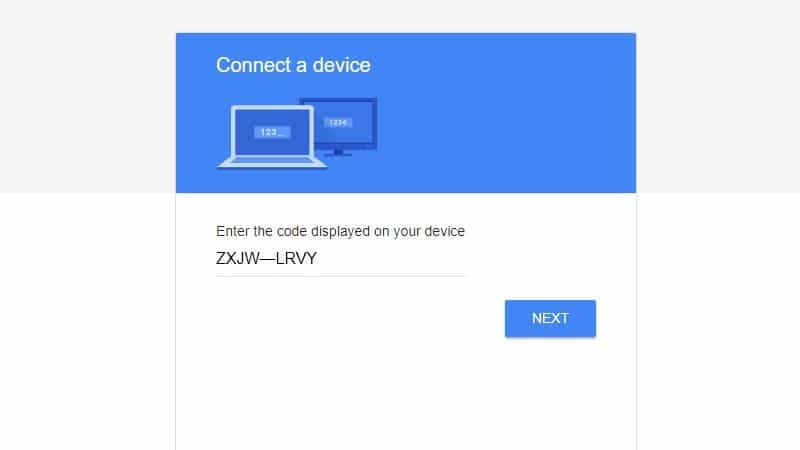 Start by opening up https://www.youtube.com/activate and entering your confirmation code, then click the Next button. 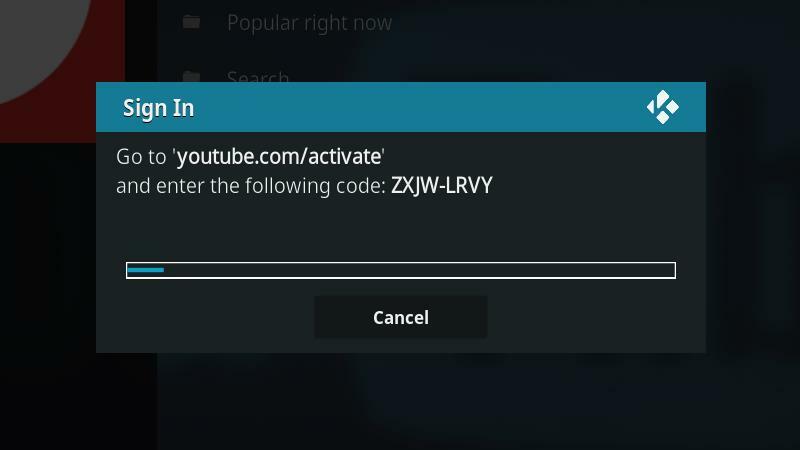 Then you’ll need to click the Allow button in order to link your YouTube account with the YouTube Kodi addon. Keep in mind that you’ll need to repeat this step again in order to fully link your account. 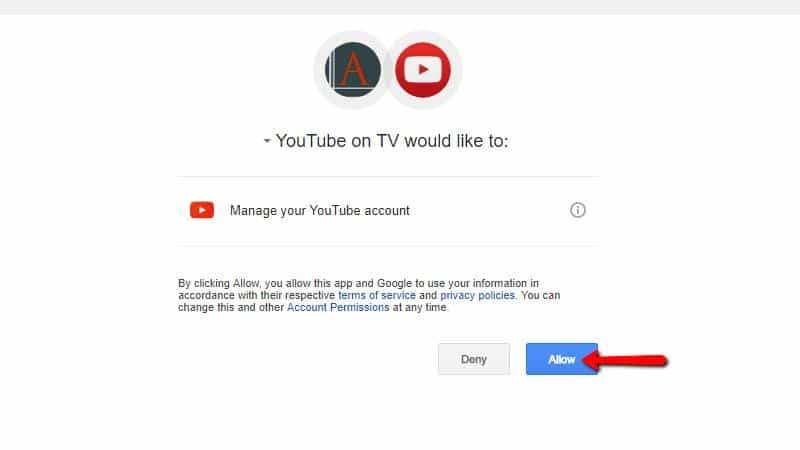 Once you’ve done that, you’ll have access to your subscriptions and other information associated with your YouTube account. There are a few other settings that I’d recommend you change, or at least take a look at. I like to set the resolution and change which folders are displayed by default. 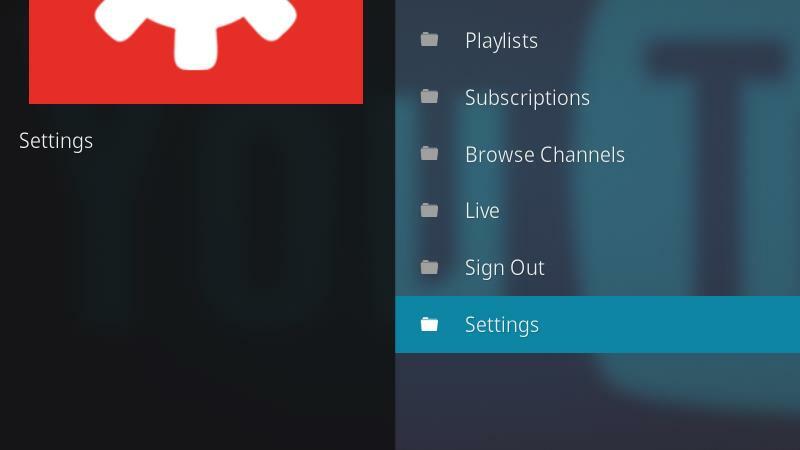 You can access the settings menu for the YouTube Kodi addon by browsing to the end of the list, then clicking the Settings menu item. 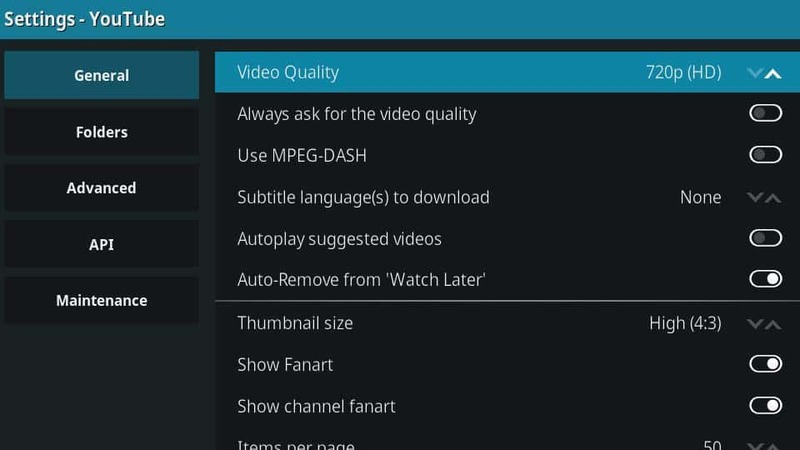 The YouTube Kodi addon won’t automatically choose the video quality, so set it where you want it. I prefer 720p for my screen, but there are options available for 1080p all the way down to 240p. Next, click the Folders menu to the left, and take a look at what’s displayed by default. In my opinion, the list of displayed items is too long. At the very least, I like to disable showing Disliked videos because I probably clicked dislike for a reason. Also, take note of the Maintenance menu. If you ever have problems with the YouTube Kodi addon running slowly or crashing, you should clear your cache from that menu. Once the YouTube addon has been installed and configured, streaming videos from YouTube is easy. 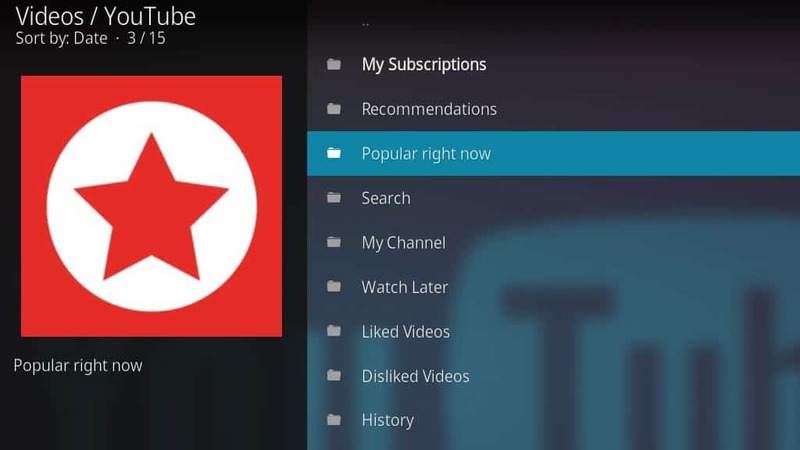 To browse YouTube, start by launching the addon from the Addons menu on Kodi’s main screen. You’ll be able to see content based on your subscriptions, see what’s trending on the site, and search for videos. 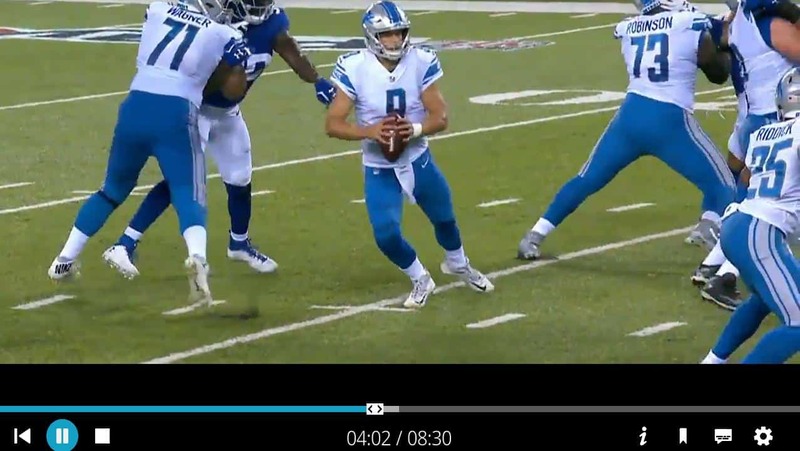 The YouTube Kodi addon displays all of the video’s metadata on the left. When you find something you want to watch, click the video to open it and start watching. After your video has started streaming, you can use the addon’s controls to pause or skip around, enable subtitles, and change the playback resolution as usual. That’s all there is to installing and configuring the YouTube Kodi addon. I appreciate the convenience of being able to watch YouTube videos without having to exit Kodi and launch a different app, so I’ve found myself getting a lot of use out of this addon. There’s no denying that a lot of the best streaming content on the web is on YouTube. Whether you want to watch VEVO music videos, check out your favorite Let’s Player, or watch new movie trailers, it’s really convenient to be able to run YouTube on your tv. 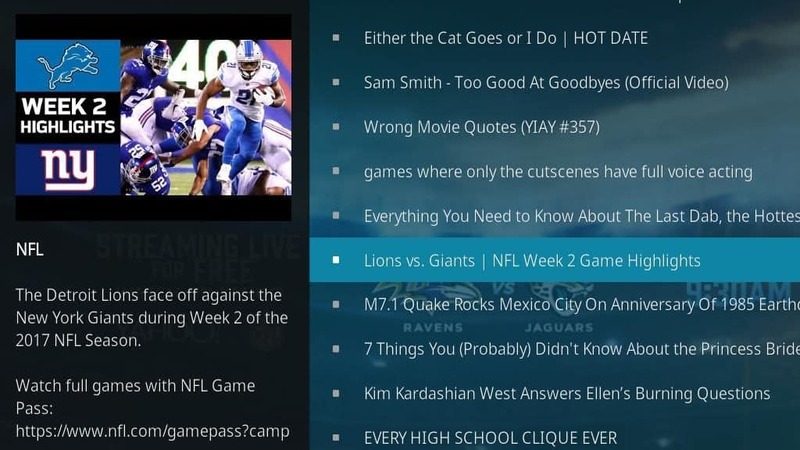 Popular: The best Kodi movie addons and how to install Kodi on Firestick. i’m sure your how to works and everything, it’s just i can’t seem to find youtube where everyone is pointing to. i’ve been having trouble with youtube lately, and ended up uninstalling it so that i could reinstall and figure out what the problem was, but now that it’s gone i lost access to a lot of stuff. is there any way to get it back? Good question! 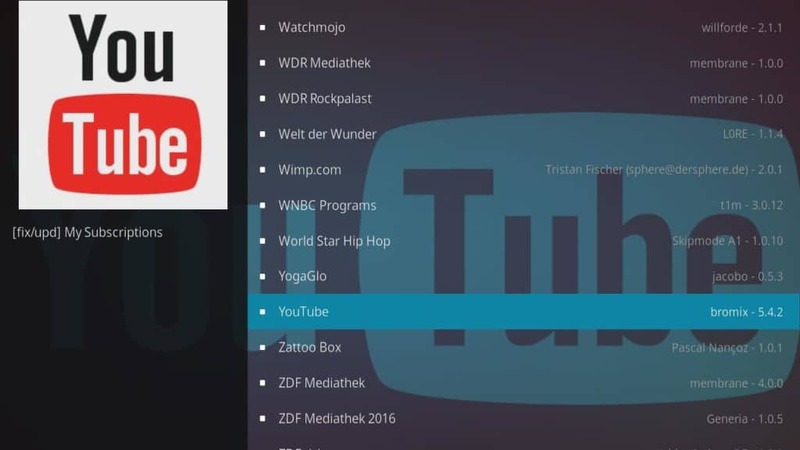 You’d expect the YouTube Kodi addon to be in the list of available Video Addons by default. 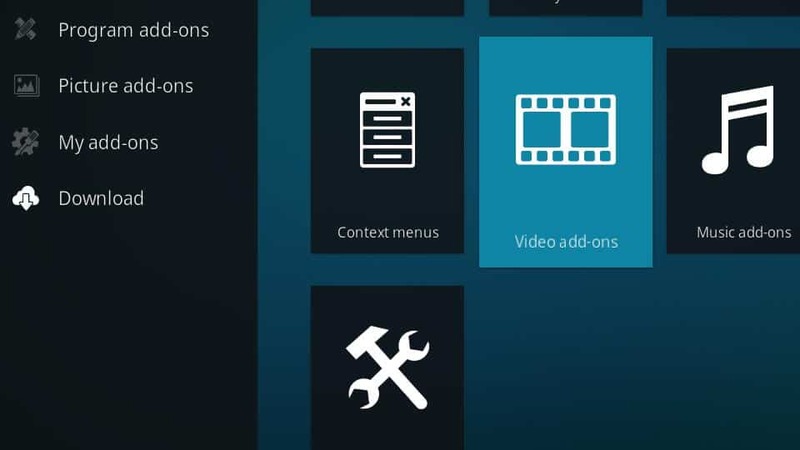 Since it’s not there you might have to reinstall over top of your existing Kodi installation. But if you do, back up the Program Files\Kodi folder first so you don’t lose any settings that might be stored there. Let me know how it goes. I used to be able to enter about 5 searches in the past and they would always remain listed. Now I can only save 1 at a time, and the previous subject is always deleted.Why? Hi Joe, thanks for reading. I couldn’t tell you for sure, but my guess is that YouTube has made some changes to their search history API. You’re seeing this a lot right now with YouTube. They’re doing everything they can to get people using their official app in order to continue showing ads and pushing YouTube Red. They did something similar when they restricted API access to your Watch Later queue. Unfortunately, unless YouTube ever releases an official Kodi addon, I believe you’re going to keep seeing features disappear or change whenever YouTube updates their API. 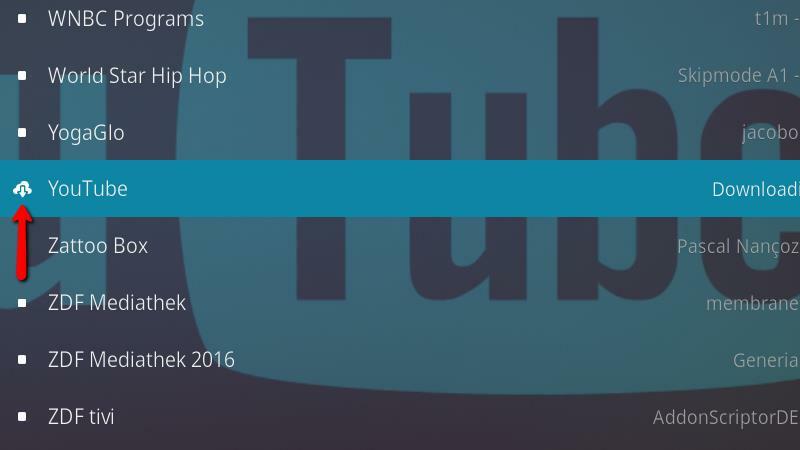 HI, I have been watching YouTube on Kodi for 13 months now. I have my own key and everything worked fine TILL Jan 2, 2018. I was able to steam live webcams, live news channels and live music until the 2nd. I can still watch everything ells on YouTube BUT NO live streams. I even change my YouTube key, no luck at all. On any other DEVICES I CAN watch all live steam, but not on Kodi on my PI3. All *** this on Jan. 2*** called my ISP (COX) and no, it has nothing to do with net neutrality (PER COX). Is anyone having the same issue as of Jan. 2 2018??? ?